Beef, cherry tomatoes and butternut squash in a red wine gravy with roasted rosemary potatoes. Cooking our prime British beef slowly for three hours intensifies its rich flavour. Our experts use a bold, punchy Chianti and simmer it with muscovado sugar for a glossy finish. Golden, crisp rosemary and garlic roasted potatoes are perfect for soaking up every drop. Roasted Rosemary Potatoes (41%), Beef (17%), Water, Cherry Tomato, Butternut Squash, Chianti Red Wine(2%), Red Wine, Beef Extract, Cornflour, Balsamic Vinegar, Wheat Flour (Wheat Flour, Calcium Carbonate, Iron, Niacin, Thiamin), Rapeseed Oil, Dark Muscovado Sugar, Garlic Purée, Beef Gelatine, Salt, Sugar, Tomato Paste, Onion Extract, Porcini Mushroom Powder. Roasted Rosemary Potatoes contains: Potato, Rapeseed Oil, Garlic Purée, Rosemary, Black Pepper. Balsamic Vinegar contains: Red Wine Vinegar, Grape Must. Instructions: From chilled: 190°C/Fan 170°C/Gas 5 20-25 mins For best results oven heat. Remove outer sleeve and clear lid. Remove potatoes and place directly onto a pre-heated baking tray, then also add the plastic tray containing the meat and sauce alongside potatoes and heat for 20-25 minutes. Leave to stand for 1 minute after heating. Stir meat and sauce before serving. Instructions: From Frozen: 190°C/ Fan 170°C/ Gas 5 30-35 mins For best results oven heat. Remove outer sleeve and clear lid. 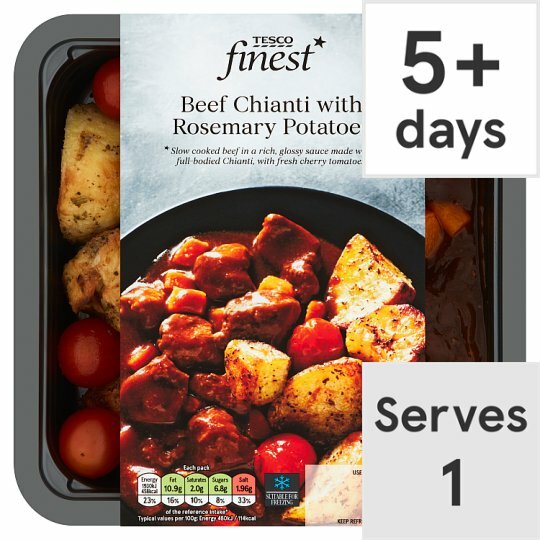 Remove potatoes and place directly onto a pre-heated baking tray, then also add the plastic tray containing the meat and sauce alongside potatoes and heat for 30-35 minutes. Leave to stand for 1 minute after heating. Stir meat and sauce before serving. Remove outer sleeve, place product onto a microwaveable plate and loosen clear lid. Instructions: Not suitable for microwave heating from frozen. Caution: When removing lid after heating, hot steam may escape.